A possible explanation for why students do not benefit from learner-controlled instruction is that they are not able to accurately monitor their own performance. The purpose of this study was to investigate whether and how the accuracy of metacognitive judgments made during training moderates the effect of learner control on performance when solving genetics tasks. Eighty-six undergraduate students solved self-selected genetics tasks using either a full learner control or a restricted learner control. 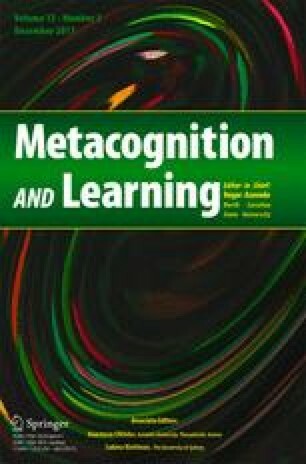 Results indicated that learner control effectiveness was moderated by the absolute accuracy (i.e., absolute bias) of metacognitive judgments, and this accuracy was a better predictor of learning performance for full learner control than for restricted learner control. Furthermore, students’ prior knowledge predicted absolute accuracy of both ease-of-learning judgments (EOLs) and retrospective confidence judgments (RCJs) during training, with higher prior knowledge resulting in a better absolute accuracy. Overall, monitoring guided control, that is, EOLs predicted time-on-task and invested mental effort regardless of the degree of learner control, whereas RCJs predicted the total training time, but not the number of tasks selected during training. These results suggest that monitoring accuracy plays an important role in effective regulation of learning from problem-solving tasks, and provide further evidence that metacognitive judgments affect study time allocation in problem solving context. This research was funded by the German Research Foundation (Deutsche Forschungsgemeinschaft). The authors would like to thank Sebastian Cena for the development of the electronic learning environment used in this study. Moreover, the authors would like to thank Dr. Ros Thomas and Dr. Emily Thompson, Webster University, for their comments on a previous draft of this manuscript. Author Loredana Mihalca declares that she has no conflict of interest. Author Christoph Mengelkamp declares that he has no conflict of interest. Author Wolfgang Schnotz declares that he has no conflict of interest. The work was supported by the German Research Foundation (Deutsche Forschungsgemeinschaft - DFG) and DFG Graduate School “Teaching and Learning Processes”, University of Koblenz-Landau, Germany. All procedures performed in this study involving human participants are in accordance with the ethical standards established by the Ethics Commission of Deutsche Gesellschaft fuer Psychologie (German Psychological Society). The diastema (the space between the upper incisors) is a dominant trait (D), while the lack of it is a recessive trait (d). What phenotype (and what percentage) will the offspring of a heterozygous couple for the distema trait have? 25% without distema and 75% with diastema. In humans, brown eyes (C) are dominant over blue eyes. What is the genotype of the father (who has brown eyes) of a blue-eyed child, if the child’s mother has blue eyes?